You would like to start a renovation project in your house or apartment, but it all seems overwhelming? Are there too many specific terms about colours and styles and you are not sure what it all means? In my blog I shall explain some of the terminology and share with you some of the latest trends in interior design. Understanding the basic design elements from my blog will help give you a better understanding of interior design concepts. And with my professional advice we can start to imagine creating a stunning new space for you and everyone who lives in it. Today I would like to talk about “Classic European Style”, what it means and how it can be incorporated in your home. The classical European home décor was very much influenced by the ancient Greeks and Romans, with a large central focal point like a fireplace and the décor organized around it. High ceilings are not only impressive but also symbolized the power and wealth of the owner and them being close to their gods. Natural materials like sand stone, Italian marble, Egyptian cotton and finest woods were the go-to materials to achieve this very sophisticated look. The colour palette included off white, beiges and browns with accents of burgundy, cobalt and terracotta. The furniture for this look was mostly on a larger scale to host large groups of guests and visitors. From this origin, many different styles developed over centuries in different regions of Europe; yet those styles all have a very special feel and look, the key elements are still to be found in all those settings. A typical Tuscan Castillo is built of bright natural stone, which reflects the sun and keeps the inside nice and cool. Shutters and terracotta roof tiles also help to make the hot summer bearable, and are important for the style of those houses. The inside also has a bright colour palette and tiles are usually used throughout the house. Large, rustic, wooden dining tables are meant to host large family feasts, which are cooked over the fireplace in the large kitchen. 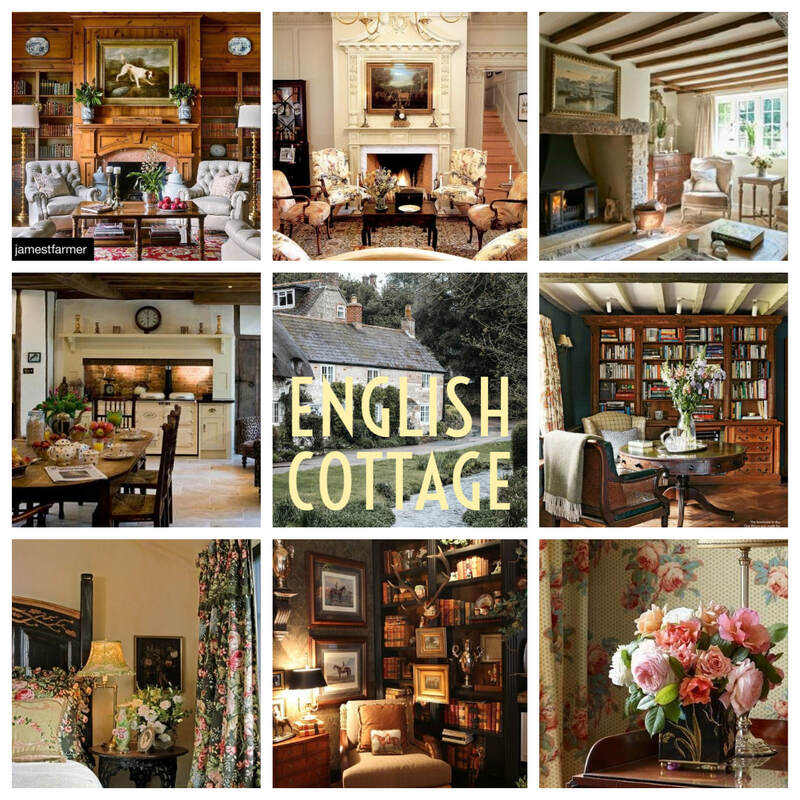 English Cottages are usually set with a darker colour palette, wood paneling and bold colours in fabrics and wallpapers. Floral patterns on curtains, wallpapers and upholstery are also commonly used with this style to draw in the feel of the beautiful English gardens. 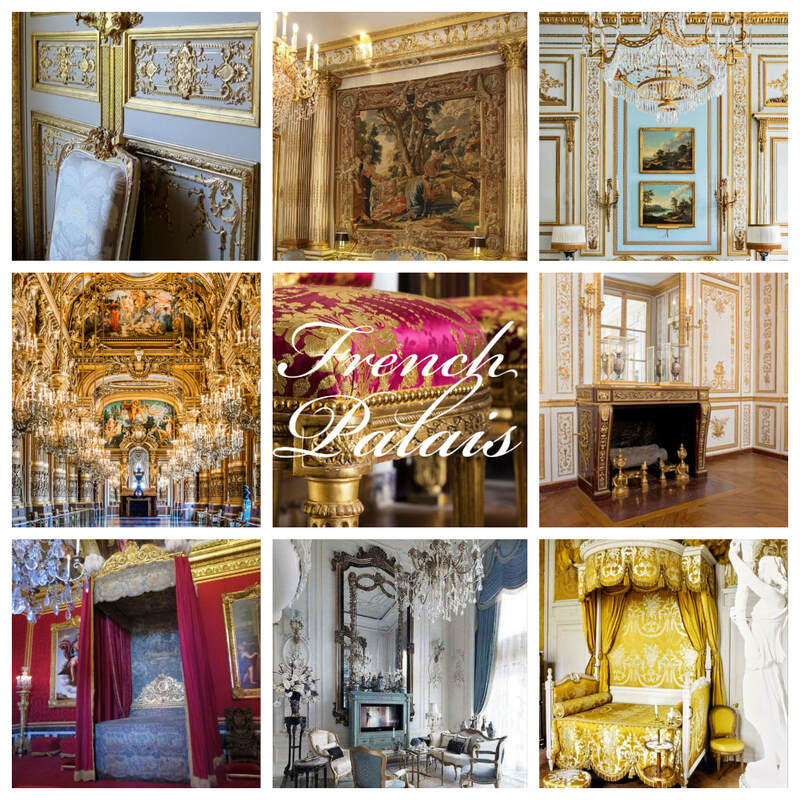 On the contraire we can find the French Palais, which is inspired by Versailles. Very high ceilings with elaborate stucco, crystal chandeliers and golden accents make a very great first impression. Large mirrors make the rooms appear even bigger than they are and walls are covered in ornamental silk fabrics. Lush drapes frame the windows and brocade covered furniture hosts large groups of guests. These styles are only a few examples of the variety that developed over time and they all have their own local touches and accents; but they all have their décor organized around a large focal point in each room and are based on their own unique colour palette, accessoires and materials. Repainting a room in a colour scheme that matches the style can instantly transform a living space and wallpaper can add a more dramatic look to the interior design of a room. In order to achieve a rustic country theme, adding wood beams is a great way to accomplish this look. Columns are also a great way to achieve the desired look for your home and there are various styles that will perfectly match the look you are aiming for. Does your look require a crystal chandelier or a wrought iron candle holder^ The perfect light fixture is a great focal point in the center of the room, which will illuminate your ‘Old World’ space beautifully. Bringing in the right accessories and souvenirs from your last trip to Europe will finish the transformation of your living space beautifully. A painting that you found in Madrid on your last vacation or a bouquet of flowers in this lovely crystal cut vase from Italy will create a the perfect feel of Europe, that you love so much. ​Accomplishing a “Classic” European look that reflects your personality and style can be accomplished easily during your design Journey with me. Let’s talk about your vision and ideas so I can learn more about you, your space and everyone who lives in it and create a professional design plan for your wonderful project. You prefer a modern European look over the classic style, we can talk about this as well and I will talk about this topic in one of my future blogs. Welcome to my first blog. Today we are going to focus on the basic knowledge of colours and how to use the colour wheel. 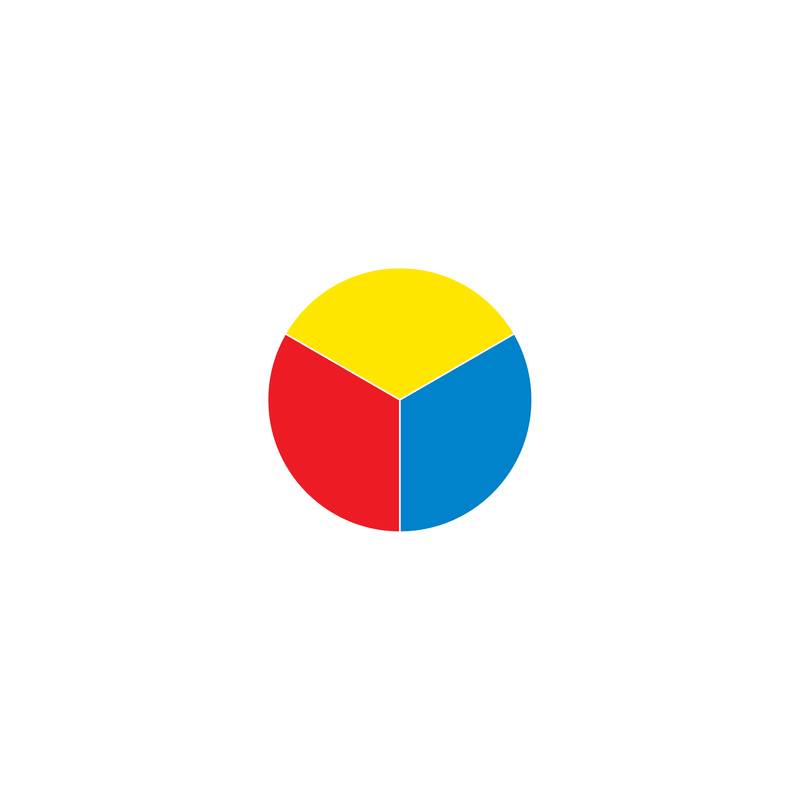 Everything starts with the Primary Colours (Red, Blue & Yellow). 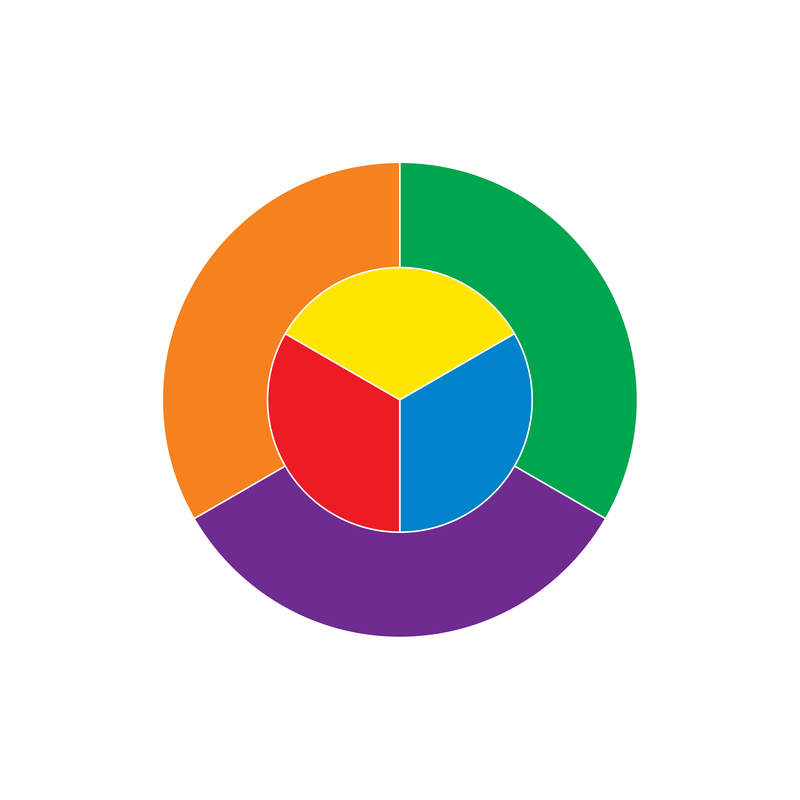 Those colours cannot be mixed from any other colour and are the foundation of the colour wheel. The Secondary Colours are Orange, Purple and Green. Those can be made by mixing any two of the Primary Colours together. Finally there are the six shades of Tertiary Colours, which can be mixed by one Primary and one Secondary Colour. Picking one of the 12 colours from the wheel is a great starting point for your renovation project. Once you picked a basic colour from the wheel, you can create create new versions of it by adding neutral colours. The newly created colour will still be in the same family as the original. You can Tint a colour, by lighting it and adding white, or Shade a colour by simply making it darker and adding black to the original colour. The third option is to Tone a colour, which can be achieved by adding grey. All options can change the original colour very drastically. If you have access to art supplies, I would suggest you try some of those options to see what you can achieve by simply mixing colours. You can also pick up some sample palettes in your local hardware or paint store. The colour wheel and its modification is only the starting point for your new home. You can simply pick a colour you like and start from there. 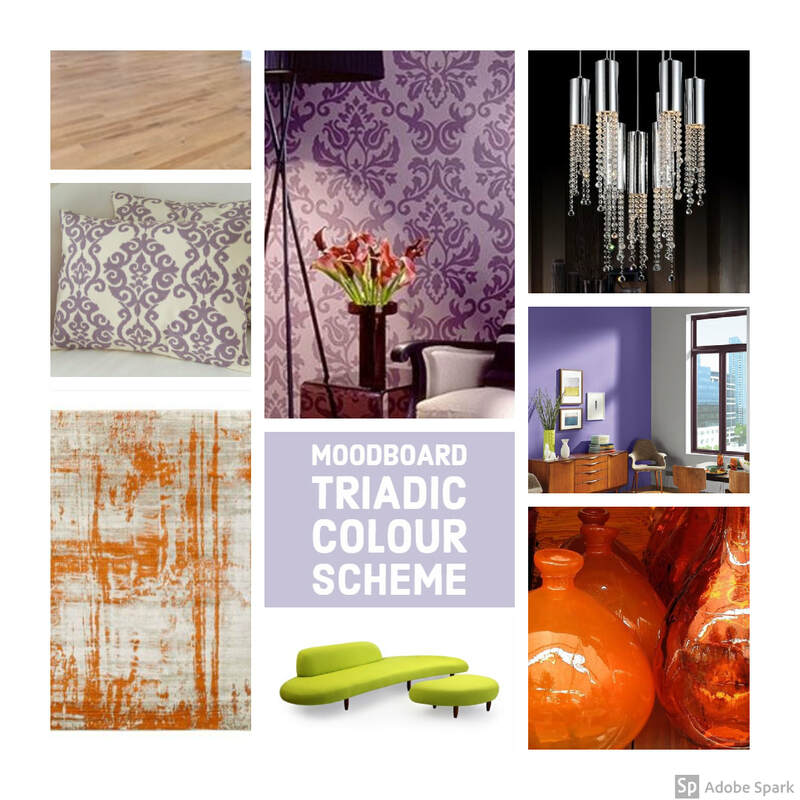 Below are 3 colour schemes that show how to use the colours to create a beautiful and modern home. 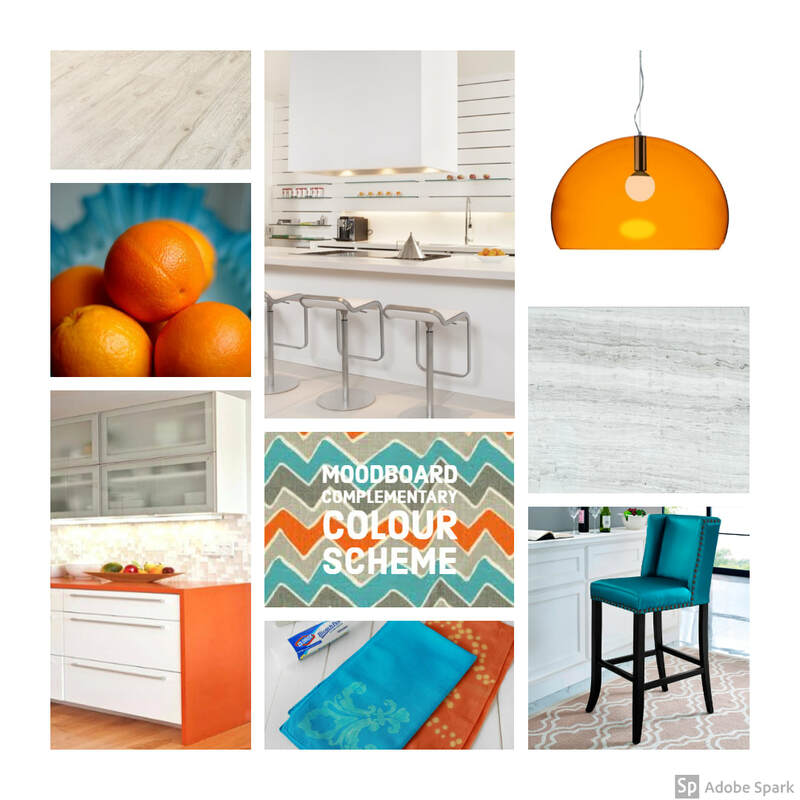 This mood board shows the Complementary Colour Scheme, which uses two colours, which are located at opposite sides of the colour wheel. As this is a very extreme contrast, it should be used with lots of neutral colours so it does not get too intense. For the analogous colour scheme you can simply pick one colour from the colour wheel and then choose shades or tones from the two neighbouring colours. This will complement your main colour beautifully. 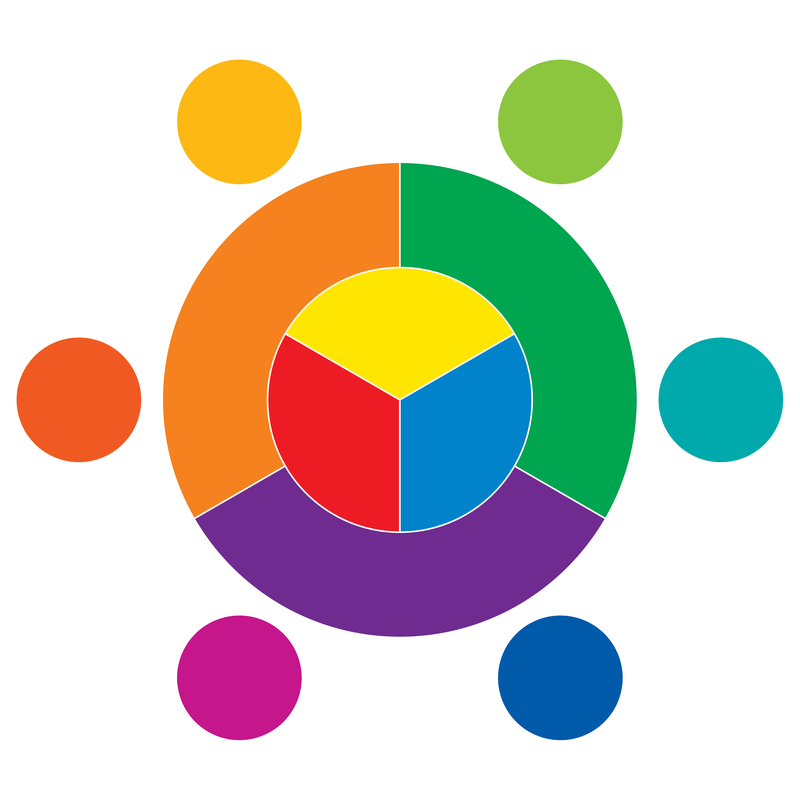 For the triadic colour scheme you simply pick one colour and then two others, so there is an even space between all colours. In this case I picked the secondary colours Purple, Green and Orange. Different tones and shades as well as neutral colours will create a living space that works great for you. As the Principal Designer and Owner of Mon Dieu Interior Design, I will share some interior design insights and the latest trends with you in my posts.